To make connections and build relationships designed to help protect our ocean. We are a watery planet. The ocean covers about seventy percent of the earth and supports life as we know it. It’s the blue heart of our ecosystem. Half the oxygen we breathe comes from the ocean. It plays a critical role in climate regulation, food provisioning and people’s livelihoods. It also offers many other benefits which help make life worth living for us all, from the beauty of a seascape to the thrill of underwater creatures or surfing the waves. But pressures on the ocean including climate change, pollution, habitat destruction and over-fishing are immense and growing. There has been a fifty percent decline in marine biodiversity over the past forty years. The need to increase the effectiveness of conservation is urgent. The consequences of not doing so will impact on everyone, but soonest and hardest on those who have least. Initial research published by us in 2013 suggested that underlying the threats facing the ocean was the need to improve the flow of information across siloes in the marine environment and make knowledge more accessible to all. As a result, Valuing the Ocean has focused support on improving collaboration and the ability to communicate the value of the ocean to influence long-term change. Our hypothesis is twofold. One, that people will act to protect what they value. Two, that to bring about significant change we need an ecosystem of organisations with different skills and interests working together. 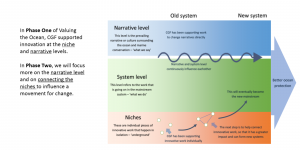 Our hypothesis is u nderpinned by a model for systemic change. We are focusing our attention on four key areas of intervention. We believe that through working collaboratively, people can achieve more than the sum of their parts: we learn from each other, bring together different skills, experience and priorities, and work creatively to find new solutions. The impact is multiplied and more likely to be game-changing. Our flagship initiative for this programme is the Marine CoLABoration, a coalition of nine NGOs which experiment together. Through Valuing the Ocean we have been supporting organisations to test new ways of communicating why the ocean matters to help build communications capacity and create a new ‘sea story’ in the UK. Our focus has been both on the framing of messages and the means of engaging people, for example, through support for the Marine Conservation Society’s Community Voice Method approach and the Marine CoLAB’s #OneLess campaign. Valuing the Ocean has supported new approaches to engaging with people on marine protection issues in local communities, particularly in local coastal communities. This is not so much about championing conservation measures. It’s more about exploring what matters to people and how this can feed into more equitable and inclusive decision-making. It’s about building consensus and a shared appreciation of the value of the marine environment for local prosperity and wellbeing. 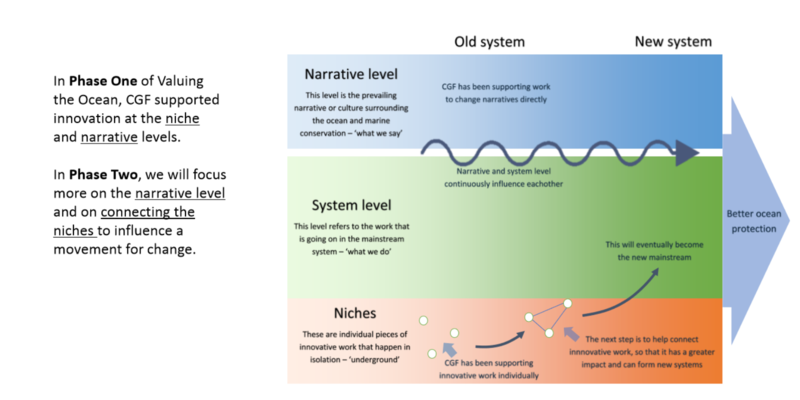 It’s about connecting people to practical activity that can influence wider policy and practice. Examples include the New Economics Foundations’ Blue New Deal initiative and Surfers Against Sewage’s Plastic Free Parliament campaign. Sustainable management and protection of the ocean depends by its very nature on effective collaboration beyond UK Waters. 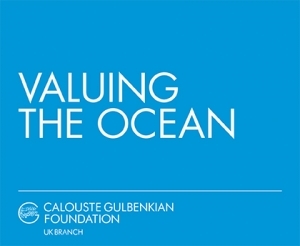 From its inception, Valuing the Ocean has always had some international scope, working alongside the Gulbenkian Oceans Initiative. From 2019, Valuing the Ocean will develop plans to focus more explicitly on an international dimension for its work. We are currently supporting Funding Fish and the Natural Capital Coalition.